Murder … Suicide … Whatever … by Gwen Freeman, a Mysterious Review. 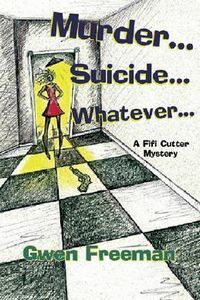 Review: Gwen Freeman introduces chronically underemployed Fifi Cutter in Murder … Suicide … Whatever ..., a half-hearted attempt at a chick-lit mystery that fails miserably. Fifi Cutter, a freelance insurance claims investigator who works whenever she can get an assignment, is desperate for money to pay the taxes on the house she inherited from her father. Before he died, her mother took everything else leaving the house an empty shell. It's important to her to keep the house, so when Fifi's half-brother Bosco arrives unexpectedly, she agrees to let him stay despite her reservations. He has a plan to raise some cash by investigating the suspicious death (murder? suicide?) of Ted Heffernan, a friend of the family and "uncle" to Bosco, and senior executive of an insurance brokerage. Ted's partner in the company is convinced it was murder, but he has a vested interest in the outcome: a corporate insurance policy on Ted the proceeds of which would pay off the judgment against the firm as a result of a sexual harassment lawsuit filed by a receptionist. Fifi and Bosco are hired to look into Ted's death and as they continue their investigation, more mayhem and murders follow. It's all a bit of a mess in the end. Locked room mysteries can be intriguing, and Freeman has created a credible variation that works within the context of the plot. The problems in Murder … Suicide … Whatever ... are with her characters, narrative, and execution. The author struggles to extract humor out of extended broken families, race relations, and corporate malfeasance, and misses the mark entirely on all three. Freeman tries to portray Fifi as a brash, brassy independent woman, but instead she comes off as selfish, condescending, and more often than not, just plain mean. In mysteries of this genre, there's often a fine line between the reasonable and the ridiculous. Unfortunately, Murder … Suicide … Whatever ... falls into the latter category. Acknowledgment: Breakthrough Promotions provided an ARC of Murder … Suicide … Whatever … for this review.